Established in 1992, Lynx Engineering has built a strong reputation for quality products and superb customer service. 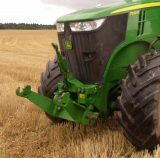 It’s a combination that makes a real contribution to productivity and profitability on farms of all sizes throughout the UK. Our product lines have been carefully selected from successful, innovative brands from around the world. The result is an extensive range of products that provide effective engineering solutions and deliver an excellent return on investment in an increasingly demanding and competitive agricultural business landscape. The Lynx range currently includes Stoll front loaders, Zuidberg front linkages and PTO systems, Zuidberg tracks, Lynx front presses and cultivators, the PowerTech range of Optima engine tuning systems, the Flexxaire range of reversing fans for super-efficient cooling and radiator cleaning – and, the most recent addition to our product portfolio, the Dromone range of pick-up hitches and coupling systems.